But that peaceable dynamic changed yesterday when Google announced a data-crunching service of its own, even as Wolfram was giving a demo of his new tool at Harvard's Berkman Center for Internet and Society. With the new Google service--which is starting in a limited way, with data from the Census and the U.S. Bureau of Labor Statistics--you can do things like enter "unemployment New York" and get a historical chart of that rate, and click to compare the rate of other states and the U.S.
Microsoft certainly benefited from having a long time window and multiple product cycles to invest in new businesses like the enterprise and entertainment. Google's window may have been much shorter (and in general I believe Google has followed the Microsoft arc albeit much more compressed. To prepare for their next act I suggest they "lawyer-up"). They have a great franchise, but they didn't build any new franchises during the land grab. So they're still fundamentally a one-trick pony. vowe dot net :: What's happening in Lotus land? edbrill.com, a private web site, has turned into the only IBM channel that keeps pushing the Notes message. Yes, there are more Lotus blogs and quite a few good ones, but they are not effective. The official IBM/Lotus sites are boring corporate sites that fail to get any excitement across. But what is the audience of edbrill.com? I may be wrong, but I think it is read by the Lotus faithful for encouragement and morale, and by a few Microserfs for amusement. I can only admire Ed for what he is doing. But you need more than one man, or a dozen, to win this. If you want to break out of this cycle, you need to do something radically different. Something visible and dazzling. The former AOL Time Warner prepares to spin off both AOL and Time; maybe they will rename what’s left “Warner”. Also see “When in Doubt, Spin It Out” for related analysis of both AOL and Skype. In a regulatory filing Wednesday, Time Warner said it was nearing a decision to spin off America Online, and put an end to the travails that began with the merger in 2000 of the two companies, a deal that has resulted in the evaporation of more than $100 billion of shareholder value. “Although the company’s board of directors has not made any decision, the company currently anticipates that it would initiate a process to spin off one or more parts of the businesses of AOL to Time Warner’s stockholders, in one or a series of transactions,” the company said in the filing. None of this is likely to excite my teen, but what do kids know? Research firm ComScore recently found that Twitter is most popular among those ages 45 to 54. Clearly, this is one Internet innovation that's wasted on the young. “For quite a few years people thought it was going to mean the demise of the television business,” says Alan Wurtzel, president of research at NBC, an American broadcast network. Yet DVRs turn out to have done little damage. Indeed, DVRs (also known as personal video recorders, or PVRs) may even have protected television and made it more conservative. Families with DVRs seem to spend 15-20% of their viewing time watching pre-recorded shows, and skip only about half of all advertisements. This means only about 5% of television is time-shifted and less than 3% of all advertisements are skipped. Mitigating that loss, people with DVRs watch more television. More than 60 percent of Twitter users have stopped using the micro-blogging service a month after joining, according to Nielsen Online research released on Tuesday. "Twitter has enjoyed a nice ride over the last few months, but it will not be able to sustain its meteoric rise without establishing a higher level of user loyalty," said David Martin, Nielsen Online's vice president for primary research. "Overheard in a bar: Swine flu is the new Susan Boyle. Still chuckling but I'm not sure why," tweeted a Twitter user by the online name CBCType." Scottish singer Susan Boyle, who became a sensation after appearing on a television program "Britain's Got Talent," was the hottest topic on Twitter before being bumped from the throne by swine flu. SAP, the world’s largest maker of business software, on Wednesday painted a bleak picture of corporate spending on information technology when it said that sales of new software fell by a third in the first quarter of the year. The Walldorf-based company said software sales – an indicator of follow-on sales from upgrades and maintenance – dropped 33 per cent to €418m, while software and maintenance revenues were flat at €1.74bn. Lawyers for the Justice Department have been in conversations in recent weeks with various groups opposed to the settlement, including the Internet Archive and Consumer Watchdog. More recently, Justice Department lawyers notified the parties to the settlement, including Google, and representatives for the Association of American Publishers and the Authors Guild, that they were looking into various antitrust issues related to the far-reaching agreement. On Monday, it was Facebook’s turn to make a move in its evolving chess match with Twitter, the rapidly growing micro-blogging service. The company announced the Facebook Open Stream API, a program that will allow third-party developers to create applications that pull in Facebook “streams” -– the current of status updates, photos and links that members see when they visit the service. Now we can expect to see a flowering of third-party programs for Facebook for computers and mobile phones, much like programs like Seesmic Desktop and Tweetdeck are favorites for heavy users of Twitter. Microsoft Online Services Available for Purchase Worldwide: Accenture, Avanade and EDS, an HP company, each sign Microsoft Online Services agreements; more than 4,000 partners signed on globally. Microsoft Corp. today announced that organizations of all sizes can purchase the Business Productivity Online Suite, a part of Microsoft Online Services. The suite or its individual services, including Microsoft Exchange Online, Microsoft SharePoint Online, Microsoft Office Communications Online and Microsoft Office Live Meeting can be purchased by businesses in 19 countries worldwide. The Business Productivity Online Deskless Worker Suite, a low-cost version for occasional users, is also available for purchase. Also starting today, Microsoft is offering a 25 percent discount on the Business Productivity Online Suite to customers who purchase it by the end of June 2009. More information about the services and global availability can be found at http://www.microsoft.com/online. Thus, Unlike basic internet search -- which has been already been nicely used by Google to track emerging flu epidemics -- Twitter seems to have introduced too much noise into the process: as opposed to search requests which are generally motivated only by a desire to learn more about a given subject, too many Twitter conversations about swine flu seem to be motivated by desires to fit in, do what one's friends do (i.e. tweet about it) or simply gain more popularity. Perhaps the most important change to occur is the replacement this week of SVP Scott Dietzen–who been in charge of all communications and communities products at Yahoo (YHOO)–with former Adobe Systems (ADBE) exec Bryan Lamkin, several sources said. Dietzen–who sources said is more entrepreneurial than managerial and did not want to lead such a big organization at the Internet giant–will become VP of strategy in the move. Many said they expect he will eventually leave Yahoo to try his hand at another start-up. Finally, the takeover is also a defensive move. Oracle did not want to let IBM get its hands on Java and Solaris, and felt it had to react to what looks more and more like a thorough restructuring of the computer industry. Since the early 1990s the industry has resembled a cake made of horizontal layers of technology, with each layer dominated by a few companies. Cisco, for instance, provided most of the networking gear. Sun and HP sold servers. Oracle was the leader in databases. IBM’s mainstay was services. SAP, a German giant, ruled in business software. This structure is now collapsing as the industry’s heavyweights move into each other’s layers. HP bulked up its services division by buying EDS, for example, and has also moved more into networking. Cisco will soon start selling servers, and has formed an alliance with several smaller hardware and software firms to build, in effect, a data centre in a box. The industry is, in other words, going back to its past, when it was dominated by a few integrated companies that tried to do it all. While composite applications can add value to Notes applications by allowing end users to interact with data in multiple Notes and non-Notes repositories, there is very little (if any) additional Notes functionality being delivered to Notes developers. 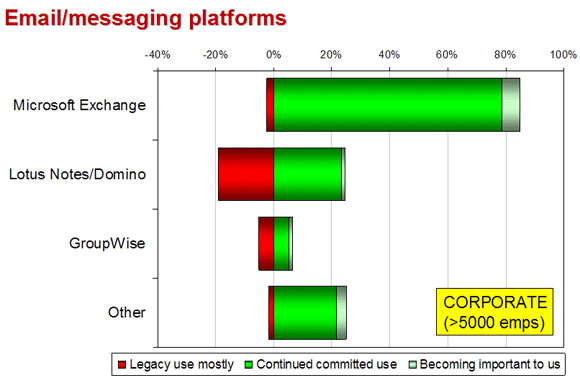 Does this mean that IBM views Notes/Domino as a “legacy environment,” rather than as a first-level RAD platform? IBM says one thing, and then appears to do another (first Workplace, now Component Applications). Notes development for Notes client and browser access was once unified — a Notes Navigator, View, Form, etc., had a similar Notes client and a Web manifestation. Yes some tailoring, by adding HTML fragments, was possible, but this was icing and not cake. IBM has now fragmented Notes/Domino development with separate approaches for Notes clients (Composite Applications) and the Web (Xpages). Ferris believes that if IBM wishes to signal that Notes/Domino is not a “legacy environment” ripe for replacement by Microsoft offerings, it urgently needs a road map that describes how it will reunify Notes/Domino development for Notes Clients and the Web, and then execute to it. At one point Lotus Notes/Domino possessed many advantages over Microsoft Outlook/Exchange/SharePoint; for example, shared-nothing redundancy, rapid email dial-tone after a failure, etc. Microsoft has now caught up, and in some areas surpassed Lotus. The two areas in which Lotus still possesses an advantage are: the ability to take documents offline and resynchronize them at a later date (SharePoint currently lacks such a facility), and RAD. IBM needs to bolster this RAD capability if it wishes to protect its Notes/Domino franchise. I’m troubled by the way Apple caved into pressure here. Of course this application is deeply offensive, with no redeeming value except to people who like to play gross games or have twisted senses of humor. But as I wrote in February, the App Store is coming to resemble a bookstore. The applications available there can have political, social or literary content. And we know that one person’s manifesto is another’s heresy, and that your masterpiece may well be trash to me. Do we want Apple to be able to block applications that include praises for the Palm Pre or criticisms of the salary of Steve Jobs? There are some potential limits. Mitch Kapor, a leading figure in the open-source world, points out that MySQL has a life beyond Oracle’s control: the software has already been “forked”, meaning alternative open-source versions have been created that are outside Oracle’s control. Yet maintaining Java’s openness, while at the same time directing its future development, will be a delicate balancing act, requiring the exercise of what Bill Whyman, an analyst at ISI, calls “soft power” – not Mr Ellison’s strength. It’s official. The Oprah effect has worked its magic on Twitter. Since Oprah Winfrey’s first on-air tweet Friday, traffic to Twitter has jumped 43 percent, according to Hitwise, a Web tracker. And Ryan Block, former editor in chief of Engadget, estimated that more than a million new users joined after Ms. Winfrey called attention to the microblogging service. Apple watchers anticipate that the company will unveil new iPhones at its Worldwide Developers Conference in June and perhaps a tablet device later in the year. Discussing rumors that the company would develop a so-called netbook — a small, low-cost laptop with limited features — Mr. Cook expressed little interest. Companies see the freebies and payments to bloggers as a cheap way to boost brand buzz during the recession. But site visitors often don't realize they're reading a promotional pitch. Not all bloggers make clear that they are being compensated to talk up products, if they disclose it at all. The Internet is becoming so rife with paid blogging that the Federal Trade Commission, which guards against false advertisements, is examining whether it should police bloggers. As it updates nearly 30-year-old advertising guidelines, the FTC is proposing that bloggers, and online marketers and companies that compensate them, be held liable for misleading claims. A decision from the commission is expected this summer. If it approves the guidelines, violations could spur investigations that in turn force bloggers to discontinue deceptive practices. If the deceptions don't stop, the FTC may require companies to repay customers. Years of growth came to an abrupt halt in the first quarter for VMware Inc., as license revenue for its new software fell for the first time, leading to weak sales growth and a forecast of worse results in the current quarter. VMware, based in Palo Alto., Calif., said customers remain interested in its virtualization software -- which allows one computer to run multiple operating systems --because of its cost-cutting potential. But Paul Maritz, chief executive officer, said "customers are reducing IT purchases in order to preserve cash." VMware said second-quarter revenue "will be flat or even down." The bigger news, however, may be IBM's partnership with EnterpriseDB, the commercial backer of the open-source PostgreSQL database, to embed EnterpriseDB's Postgres Plus Advanced Server technology into IBM's DB2 9.7 database product. EnterpriseDB's technology basically allows applications written for the Oracle database to run on EnterpriseDB's PostgreSQL...and now IBM's DB2. In other words, through this partnership with EnterpriseDB, IBM has gained the ability to easily migrate customers from Oracle to DB2--seamlessly, painlessly, freely. Oracle keeps all software parts of Sun. Sells off or shuts down hardware business with bad margins. Perhaps Oracle partner HP would want a few chunks. EMC may want some storage lines. And any chip maker would want the Sparc intellectual property. If the market rebounds private equity may be interested. Oracle would hang on to a few hardware lines to build its uber-database-data center machine. The HP Exadata machine with Oracle keeps going. A person familiar with IBM's position said the company isn't likely to rebid for Sun. IBM's chief financial officer, Mark Loughridge, even threw some competitive dirt on the deal during a conference call to discuss IBM's earnings Monday. "Oracle and Sun have been partnering for two decades — and what's the result?" Loughridge said. "As I look at this and ask myself, 'What's really changed,' I think, 'nothing.' "
Executives from the two companies pointed repeatedly to the benefits of this “systems” approach, combining software and hardware. Yet while Sun makes most of its revenue from selling computers, Oracle executives emphasized that they did not regard Sun as a hardware company, which suggests owning factories and large capital investments. Oracle's Fusion Middleware business is based on Sun's Java language and software, and Oracle said it could now ensure continued investment in the technology. It will also acquire the Solaris operating system, the leading platform for its database business, which is its largest. Oracle has a history of acquisitions, having made more than 260 deals valued at over $50.5 billion since July 1992, according to FactSet Research. This is Oracle's largest deal since acquiring BEA Systems for $8 billion a year ago. Server is too busy to handle request. A Oracle-Sun deal disrupts the traditional relationships formed between some of the technology industry’s largest players. Oracle, for example, has long-standing partnerships with Sun’s rivals, including Hewlett-Packard and Dell. These sellers of server computers work to fine tune Oracle’s database and business software for their computers. I.B.M., which competes against Oracle in the software market, also comes under new threats with the deal. Oracle Corp. will buy Sun Microsystems Inc. for $5.6 billion excluding cash and debt, calling Sun's Java "the most important software" it has ever acquired. Earlier this month, Sun's talks to sell itself to International Business Machines Corp. unraveled, raising new questions about the prospects for the company and Chief Executive Jonathan Schwartz, who has been under pressure to come up with an alternative for the struggling computer maker. "Kindle sales have exceeded our most optimistic expectations," Chief Executive Officer Jeff Bezos wrote shareholders in a letter filed with regulators today. Although Amazon does not release Kindle sales figures, a couple of analysts have estimated that the device and book downloads could generate between $1.2 billion and $1.4 billion by 2010. Google's Gmail Labs has just rolled out a useful, but mildly creepy feature that gives you suggestions on who you should e-mail based on previous conversations. So, if you've had threads going with a group of people, it will recommend some of those folks once you've added at least two addresses in the recipients field. Best part is, they don't even have to be in a group of contacts you've created in Gmail's contacts manager. Mr. Davis said the service was overflowing with messages, known as tweets, making it hard to filter out the important ones. Indeed, within moments of Ms. Winfrey’s first post, thousands of tweets began flowing through the system each second, welcoming the media mogul to the service. Hashmobs solve both problems by transferring the flashmob concept into a purely realtime environment. A hashmob is a virtual mob that exists entirely within the Twitter realtime stream. It derives its name not from any kind of illicit pipeweed but from the "hashtags" that are commonly used to categorize tweets. Hashtags take the form of a hash sign, ie, #, in front of a word or word-portmanteau, eg, #obama or #obamadog. The members of a hashmob gather, virtually, around a particular hashtag by labeling each of their tweets with said hashtag and then following the resulting hashtag tweet stream. Hashmobbers don't have to subject themselves to the weather, and they don't actually have to be in proximity to any other physical being. A hashmob is a purely avatarian mob, though it is every bit as prone to the rapid cultivation of mass hysteria as a nonavatarian mob. A wholly new and functionally different offering on-premise and online. This will be the case with IBM’s on-premise servers (Domino, Sametime, QuickR, Connections), and LotusLive Engage. The jury will be out for some time on this one. Exchange 2010 is the first product that Microsoft has engineered to run as well in the cloud as on-premise. That means it will be easier to split your domain and run a single managed environment (meaning one admin console, one archiving management tool set, one legal hold implementation, one message filtering solution) across an on-premise and cloud-based implementation. And that means a Fortune-class company can keep its high-volume mailboxes on-premise while taking advantages of the higher degree of automation, direct-attached storage, and new functionality of Exchange 2010. But it can also move occasional users that can get by with a small mailbox and Web email client (which they are probably using at home anyway) to a cloud provider (Microsoft itself, or a provider like USA.NET, AT&T, or LiveOffice.com). That approach won’t be as practical, for organizations that have to contend with different sets of capabilities, user experience models, and third-party tools, for on-prem and online users. Yeah, remember AT&T Network Notes – that’s probably a good analogy, in terms of the initial-hype-to-eventual-reality index… See the full post for more details. The key message is that LotusLive is a brand and not a product, and that the LotusLive brand will be applied to both an initial, and an expanding and evolving, set of products. The technology that will form the basis of some of these LotusLive products already exists in Lotus on-premise offerings, and some of these on-premise offerings (Notes/Domino, Sametime, QuickR) are already capable of multitenanted deployment (remember AT&T Network Notes!). So much for playing hardball: IBM is apparently not interested in resuming talks to purchase Sun Microsystems, following their recent break down. IBM is believed to be concerned about the level of scrutiny a potential acquisition of its smaller hardware and software rival might would draw from regulators. The clearest sign of change may be that for the first time in its history, Google’s work force shrank. The company ended the quarter with 20,164 employees, down 58 workers from the end of the year. The decline may be modest, but it is a sharp contrast from just 18 months ago, when Google added more than 2,100 employees in a single quarter. Google’s rate of growth has slowed in an equally stark fashion as a result of the recession and of Google’s own vast size. Revenue in the first quarter rose just 6 percent to $5.51 billion from $5.2 billion a year ago. First quarter growth was 42 percent in 2008 and 63 percent in 2007. But while YouTube, along with other new media properties like MySpace, Facebook and Twitter, is seen as leading the challenge against traditional media companies, the company itself is struggling to profit from its digital popularity. This month, Credit Suisse published a detailed analysis of YouTube’s business, estimating that the site will lose approximately $470 million in 2009, as the costs of bandwidth and storage to stream more than 5 billion clips a month far exceed the revenue YouTube earns from advertising. Sun Microsystems Inc (JAVA.O) would be willing to resume takeover talks with International Business Machines Corp (IBM.N) if IBM made a stronger commitment to closing a deal, Bloomberg said, citing two people familiar with the matter. But there were no discussions as of Wednesday and each company is waiting for the other to make a move, the sources told the agency. The problem for IBM isn’t the quality of its products, or the impressive amount of research it puts into adapting Web-based collaboration for the enterprise (IBM doesn’t break out its research budget by category, but reports an annual R&D budget in excess of $6 billion on research and development). The problem, rather, is its corporate approach to piecing together application suites to suit its own goals rather than customer needs — never mind its clear lack of Web savvy. But Wharton faculty argue that Twitter's best future may be as part of a larger service. Indeed, Facebook and Twitter have already partially integrated their services; Twitterers who also use the Facebook service can have their Tweets delivered as Facebook status updates. Salesforce.com, which makes on-demand customer relationship management software, has integrated Twitter into its application. And Matwyshyn says Twitter would make a lot of sense as part of Google's Gmail or Yahoo Mail. Twitter, however, may turn out a lot like ICQ, Fader suggests. An instant messaging service, ICQ garnered 13 million users in just 18 months and AOL pounced to expand its customer base. "ICQ is a perfect analogy for Twitter. You do one cute thing you couldn't do before, but it can't stand alone," says Fader. "I'm not knocking ICQ: Those guys made a lot of money for their idea." The McKinsey study, “Clearing the Air on Cloud Computing,” concludes that outsourcing a typical corporate data center to a cloud service would more than double the cost. Its study uses Amazon.com’s Web service offering as the price of outsourced cloud computing, since its service is the best-known and it publishes its costs. On that basis, according to McKinsey, the total cost of the data center functions would be $366 a month per unit of computing output, compared with $150 a month for the conventional data center. “The industry has assumed the financial benefits of cloud computing and, in our view, that’s a faulty assumption,” said Will Forrest, a principal at McKinsey, who led the study. CNN gained nearly a million Twitter followers on Wednesday when it acquired the @cnnbrk Twitter account. The account, the largest on Twitter with more than 947,000 followers, had been maintained and nurtured by James Cox. CNN did not disclose financial details of the acquisition, probably because rules at the microblogging site prohibit the selling of Twitter accounts. The acquisition comes as the race to 1 million Twitter followers heats up. As of Wednesday afternoon, Ashton Kutcher was in second place with 917,000 followers, followed closely by Britney Spears, who has about 913,000 followers. My $.02: the entire Twitter #amazonfail incident is a multifaceted and ominous example of what can happen when micro-blogging information access isn’t combined with information quality and information literacy. See the full NYT blog post for more details. The Twitterati have long marveled at how effective the micro-blogging service is at spreading the news, 140 characters at a time. The crash of a US Airways Airbus in the Hudson in January is Exhibit 1, but there are many other examples. Not surprisingly, Twitter is equally efficient at spreading misinformation. Over the weekend, Amazon faced a Twitter-driven storm of criticism after gay-themed books disappeared from its sales rankings, leading to accusations of bigotry and censorship. Somewhere along the way, a hacker claimed responsibility for the incident and posted a description of how he did it. Pretty quickly the claims were reverberating through the Twittersphere, where plenty of people, though by no means all, took the claims at face value. Will JoltID Turn EBay’ Dream of Skype IPO Into a Nightmare? Unfortunately, there are some problems eBay will need to address in order to make this IPO happen. Lately, there have been rumors of a buyout offer coming from the founders Niklas Zennstrom & Janus Friis, along with a consortium of buyout funds that includes KKR, Providence Equity Partners and Warburg Pincus. That news comes after JoltID, a company controlled by Niklas and Janus sued Skype over issue of core P2P technology. Skype/EBay later filed a counter suit. Having followed Skype for a long time, I know for sure that this is a big deal and any plans of an IPO can be derailed by this litigation. In a post back in 2006, I had pointed out that this core technology wasn’t part of the Skype-eBay transaction. "When you look at it from an individual user perspective you're only talking about 0.3 grams of carbon dioxide per spam message," said Dave Marcus, director of security research and communications at McAfee's Avert Labs, in a telephone interview. "When you extrapolate the math out to the larger numbers, it definitely is significant." The McAfee report, which was written by consulting company ICF International, said the estimated 62 trillion spam e-mail that get sent each year consume 33 billion kilowatt hours of electricity, enough to power 2.4 million homes. In addition, spam e-mail releases as much carbon dioxide into the atmosphere as 3.1 million cars consuming 2 billion gallons of gasoline. Hackers made off with at least 285 million electronic records in 2008, more than in the four previous years combined, according to a new study that shows identity thieves are getting better at exploiting careless mistakes that leave companies vulnerable to attack. The number comes from a study of 90 data breaches investigated by Verizon Communications Inc., which is hired to do a post-mortem on most big computer intrusions. This book contains a detailed description of Cisco UCS (Unified Computing System) a Data Center Server designed for virtualized applications, with large memory footprint and Unified I/O. Laid-off Seattle Post-Intelligencer journalists today launched a nonprofit online news site, Seattlepostglobe.org. Former P-I reporter Kery Murakami — "I guess I'm the publisher" — said he and a half-dozen other former P-I journalists form the core staff, but more than 20 other reporters, photographers and editors have said they intend to contribute. Part of the new site's purpose is to give former P-I journalists both hope and an outlet, Murakami said. "We want them to know that it's not over, that you can still write for us, even if you have to get a job at Wal-Mart," he said. The European Commission threatened Britain with sanctions on Tuesday for allowing an Internet service provider to use a new advertising technology to track the Web movements of customers. The European telecommunications commissioner, Viviane Reding, said that use of a tracking tool created by Phorm violated European privacy laws. The country’s largest service provider, BT, acknowledged last April that it used the tool without customers’ consent in 2006 and 2007, Ms. Reding said. EBay Inc., operator of the most-visited US e-commerce site, is planning an initial public offering for its Skype unit, which it bought in 2005 for $2.6 billion. The IPO is slated for the first half of 2010, though the timing will depend on market conditions, the San Jose, Calif., company said yesterday in a statement. EBay wrote down the value of the acquisition to $1.2 billion in 2007. An obnoxious computer program that barged into Twitter's mishmash of Internet chatter served as another reminder of the challenges facing the rapidly growing service. The nettlesome program, known as a worm, targeted Twitter's network with four different attacks starting early Saturday and ending early Monday, according to Twitter co-founder Biz Stone. The worm was set up to promote a Twitter knockoff, StalkDaily.com. It displayed unwanted messages on infected Twitter accounts, urging people to visit the Web site. Individually, many of those 140-character “tweets” seem inane. EBay Inc. has sold recommendation engine StumbleUpon, a move likely to heighten speculation the struggling e-commerce giant may soon move to unload Internet-telephony unit Skype. EBay, which bought StumbleUpon two years ago for $75 million, said it had become apparent there are few long-term, strategic synergies between StumbleUpon and eBay's other units. The San Jose, Calif., company didn't disclose how much it sold StumbleUpon for. There's a quiet revolution underway at the CIA and its sister agencies. A new generation of analysts, determined to drag their Cold War–era colleagues into the world of Web 2.0 information-sharing, have created Intellipedia, a classified version of Wikipedia they say is transforming the way U.S. spy agencies handle top-secret information by fostering collaboration across Washington and around the world. Rolled out in 2006 to skeptical veterans at CIA headquarters in Langley, Va., Intellipedia has grown to a 900,000-page magnum opus of espionage, handling some 100,000 user accounts and 5,000 page edits a day, according to the CIA and the Office of the Director of National Intelligence. Google Inc. committed a major transgression by only including support for a subset of Java classes in its cloud-based App Engine development platform, according to Simon Phipps, Sun Microsystems Inc.'s chief open-source officer. "Whether you agree with Sun policing it or not, Java compatibility has served us all very well for over a decade," Phipps wrote in a blog post on Saturday. "That includes being sure as a developer that all core classes are present on all platforms. Creating subsets of the core classes in the Java platform was forbidden for a really good reason, and it's wanton and irresponsible to casually flaunt the rules." We were misinformed. The Web didn't kill mediators. It made them stronger. The way a company makes big money on the Web is by skimming little bits of money off a huge number of transactions, with each click counting as a transaction. (Think trillions of transactions.) The reality of the web is hypermediation, and Google, with its search and search-ad monopolies, is the king of the hypermediators. Schwartz and Sun have a pretty high opinion of themselves despite years of losses. So they walked away from IBM’s last offer. But don’t expect them to stay away for long. There simply isn’t another buyer for the whole thing and Sun doesn’t have the patience to cut itself into pieces. And the real price IBM will be paying is at least $2 billion less than you read in the newspaper, because Sun – like a lot of tech companies – has profits stashed overseas that it has been unable to bring back. IBM knows how to play that game, too. According to some analysts, this approach to mobile development could have large implications for the way that developers distribute their software and the way that people buy it. It's even possible that more-powerful mobile Web apps could undercut some of the business of Apple's App Store, says Chetan Sharma, an analyst who runs his own consulting firm in Issaquah, WA. Spies hacked into the U.S. electric grid and left behind computer programs that would let them disrupt service, exposing potentially catastrophic vulnerabilities in key pieces of national infrastructure, a former U.S. government official said Wednesday. The intrusions were discovered after electric companies gave the government permission to audit their systems, the ex-official said. The official was not authorized to discuss the matter and spoke to The Associated Press on condition of anonymity. Technology Review: Blogs: TR Editors' blog: How Distracting are Social Media Tools? On the surface, it seems like tags should be helpful, Budiu said, since they increase a user's engagement with an article. In addition to reading, the user considers what tags to give it and enters them. It sounds similar to highlighting key passages of a textbook, or making notes in the margin. So why should they reduce recall? Budiu found that adding tags cut into the time that each user spent actually reading an article in the first place. In other words, paying attention to tags came at the cost of paying attention to the text. It’s not too surprising that microprocessor guru Marc Tremblay has decided to leave Sun Microsystems, which was experiencing challenges and executive departures well before the brouhaha over stalled takeover talks with IBM. More intriguing is the fact that he is going to Microsoft, which is not exactly a center of chip design. Tremblay, in an email, referred questions to a spokeswoman for Microsoft. She could only provide a statement with a few boiler-plate facts about his new job: He will hold the title of distinguished engineer in the “strategic software/silicon architectures” group under Craig Mundie, Microsoft’s chief research and strategy officer. Skype makes software for Wi-Fi-equipped smartphones using Microsoft Corp.'s Windows Mobile operating system, but like Windows Mobile, the software has never caught fire. Two other iPhone programs, Nimbuzz and Fring, also enable Wi-Fi calls over the Skype network; neither has gained much traction. But since Skype unveiled its software for the Wi-Fi-capable iPhone nine days ago, customers have downloaded more than 2 million copies of the free program. That means about 12 percent of the world's 17 million iPhone users downloaded Skype in less than two weeks. Twitter traffic is exploding. Ashton Kutcher @aplusk will likely be the first Twitter user to have 1 Million followers. When I first wrote about Celebs on Twitter two weeks ago Ashton Kutcher had 521,469 followers. Today he has 753,168. At this rate he will have 1M followers by April 21st. ComScore says “Worldwide visitors to Twitter approached 10 million in February, up an impressive 700+% versus a year ago.”. Only Facebook, MySpace, Napster, and a few others have seen growth rates like Twitter. Nothing like a friendly monopolist… See the full article for more details. In his speech, Mr. Schmidt encouraged publishers to create more personalized news products that could be delivered effectively on the Web, cellphones and other devices. “We think we can build a business — again, with you guys — with significant advertising resources, where the advertising is targeted to the content,” he said. He acknowledged that many publishers were increasingly thinking about charging for their content, and said he expected the newspaper industry to eventually resemble television, where some content was free, some was purchased by subscription and some was paid for every time it was viewed. But he said he expected that advertising would remain the leading revenue model in online media. It's official: Windows dominates the netbook market, too. Just a year after the netbook phenomenon threatened to provide Linux with an inroad to the lucrative consumer market, Windows now dominates that market. A year ago, Windows accounted for less than 10 percent of the netbook market. But today, market researchers at NPD say Windows ships on a whopping 96 percent of netbooks. Personally, I don't think we've heard the end of this deal. IBM really doesn't want Sun to fall into HP, Dell, or Cisco's hands. Sun really doesn't want to go-it-alone until another suitor arrives. Last time I posted a blog on this deal, I described what this meant for other server vendors in this market. Given this situation, let's do that again. Some movie blogs, such as Ain’t It Cool News, are refusing to run reviews of the raw footage, while some members in the BitTorrent community, where illicit copies are circulating, are encouraging each other to see the movie when it opens in May. It’s hard to tell how exactly the premature distribution will affect the film’s performance in the long run. As my colleague Brian Stelter pointed out, online viewers make up a tiny percentage of the total audience. Either way, the troubling and costly leak is likely to provide fresh ammunition to the crackdown on digital piracy of content. There's tough talk coming from managers at The Wall Street Journal and The Associated Press that include threats of legal challenges and even name calling. "There is no doubt that certain Web sites are best described as parasites or tech tapeworms in the intestines of the Internet," Robert Thomson, the Journal's editor, was quoted in Australian newspaper The Australian on Monday. "It's certainly true that readers have been socialized--wrongly I believe--that much content should be free...And there is no doubt that's in the interest of aggregators like Google who have profited from that mistaken perception. And they have little incentive to recognize the value they are trading on that's created by others." Nearly 20 bloggers launched a "blog rally" to support The Boston Globe and seek ideas to help the financially struggling newspaper, threatened with a shutdown by its owner, The New York Times Co. Despite attempts to refresh the Lotus brand with a combination of new Notes and Domino releases as well as a plethora of related products such as Sametime, Quickr, Connections and Symphony, it looks as if the ‘legacy’ tag is still hanging round IBM’s neck like a millstone. Compared with Microsoft, it also happens to score very low on the ‘becoming important to us’ rating as, indeed, do GroupWise and ‘other’. It’s dangerous to draw conclusions from such slight signals, but the signs at the moment bode ill for anyone other than Microsoft. Cisco has not been spared by the recession. Its profit declined 27 percent in its last quarter, which ended in late January, and it reported flat earnings in the previous period. It is slashing more than $1 billion in expenses, partly by cutting back on travel and freezing hiring. Yet it also has $29.5 billion in cash and investments, a solid reputation, a network of product re-sellers and thousands of sales employees — assets that the company hopes to exploit. Since last year, Sun executives had been meeting with potential buyers. I.B.M. stepped up, seeing an opportunity to add to its large software business, acquire valuable researchers and consolidate the market for data center hardware. In their talks, I.B.M. and Sun had a contract to deal with each other exclusively. Now Sun is free to pursue other suitors, including I.B.M. rivals like H.P. and Cisco Systems. Cisco recently entered the market for server computers. Toni Sacconaghi, an analyst with Sanford C. Bernstein, said the Sun "board is going to have a lot of explaining to do if they turned down an offer of $9.40 a share," noting Sun's recent stock lows and the deteriorating outlook for tech spending. He added that the public disclosure of the talks with IBM "casts uncertainty among customers about Sun's future." In Silicon Valley, rivals poked fun at IBM for pursuing the fading company. But IBM -- whose earnings have grown $5 billion since 2004 to $12.34 billion last year -- has been outpacing most of Silicon Valley recently, and would stand to leverage Sun into even more gains. Adding Sun's $13 billion in sales would put IBM neck-and-neck with Hewlett-Packard Co. as the world's largest information-technology purveyor, with combined revenues of $117 billion and 41% of the $50 billion server market. IBM Corp. over the weekend withdrew its offer to buy Sun Microsystems Inc. for about $7 billion, clouding the prospects for a deal that would have shaken up the computing industry. Talks were in the final stages, but IBM took its offer off the table after Sun terminated IBM's status as its exclusive negotiating partner, according to two people who spoke on condition of anonymity. One of the people said the two sides were still meeting yesterday. Today's email problems are different than the problems people had five years ago, and Gmail's most demanding users continue to push it to its limits. We're getting more mail and communicating in more ways than ever before. Web browsers are getting faster and offering functionality that people could only dream of in 2004. We expect the changes over the next five years to be even more radical than those of the past five. For a site that generates as much online traffic as YouTube, it would seem a no-brainer that profit is streaming in. But according to a Credit Suisse analyst, the most popular video Web site — owned by the richest Web site Google — will lose $470 million this year because it sells advertising only on a fraction of its pages. Now millions of orphan books may get a new legal guardian. Google has been scanning the pages of those books and others as part of its plan to bring a digital library and bookstore, unprecedented in scope, to computer screens across the United States. But a growing chorus is complaining that a far-reaching settlement of a suit brought against Google by publishers and authors is about to grant the company too much power over orphan works. Proceeds from the program, including advertising revenue from Google’s book search service, will be split; Google will take 37 percent, and authors and publishers will share the rest. Google will also help set up a Book Rights Registry, run by authors and publishers, to administer rights and distribute payments.